Beautiful 3 bedroom, 2 bathroom, pool home on a freshwater canal with easy access to Mohave Lake. Huge pool area on a triple lot site. This tastefully decorated villa is just few minutes away from most exclusive marina Cape Harbor, restaurants and shops. Spacious, fully screened, south facing and landscaped lanai. Big solar heated pool with a peaceful canal view. The spacious pool deck with quality patio furniture and a gas BBQ grill. The large master bedroom suite has a walk in shower, a king size bed, a 42'' led flat TV, and access to the pool. The kitchen is fully equipped. A large family room furnished with 2 leather sofas, recliner, large 60'' LED TV, Home cinema entertainment system. a game room with a pool table, 2 adult bikes, 2 kid bikes. Gelegen an einem breiten und ruhigen Frischwasser Kanal mit Zugang zu dem bekannten Mohave Lake, grosse Pool Area mit Suedlage, elektrisch beheizter swimming pool, geschmackvolle Einrichtung, 3 Schlafzimmer mit 2 Baedern, 3 Tv's , game room mit billiard Tisch, komplett ausgestattete Kueche, 2 Fahrraeder fuer Erwachsene und 2 Fahrraeder fuer Kinder stehen zur Verfuegung, zentral gelegen in SW Cape Coral in der Naehe des Skyline Blvd und nur wenige Minuten von Tarpon Point Marina entfernt. Bob Orlando was friendly, and when we had an inquiry, he got back to us almost immediately. His restaurant recommendation was appreciated, and turned out to be one of our favorite places to eat! The "Pool Guy" was professional, and had a lot of good "local information" for us. We actually enjoyed his visit. He kept the pool nice for us. Our annual visit to "Tranquil Turtle" is like coming home each year. We have stayed here twice in the past, and look forward to next year. It has everything we need, and we particularly enjoy the pool area with the big shade tree, and watching all of the wildlife on the canal. We really do have a "tranquil turtle" that visits almost every day at the dock! It is a quiet home in a quiet neighborhood. We can sit back, swim, or take a nap with no disturbance. Priceless! Although we had very few problems, if an issue arrived, the Vesteva staff was diligent in resolving each issue. This was a really nice place to stay. The house was fantastic. The pool area outside was very nice. It was super clean. Very quiet and safe area. We enjoyed the pool table and the pool. The only downside is the location. 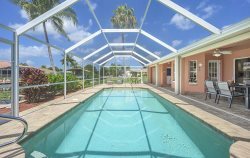 You will be 20-30 minutes from Sanibel Island, Fort Myers Beach, good shopping malls, restaurants, etc. I would stay here again. Property is in a great location. The pool was nice to jump into everyday and we loved having the pool table to entertain us at night. This property is right on a canal and is so peaceful. Would highly Recommend renting with Vesteva. Thanks so much for a nice place to stay on a not so very nice week attending my brothers funeral. It was much better then going to a hotel. The House was just perfect. We had everything we needed. We would definitely stay here again if it is available. Vanessa was very personable and helpful with all of my questions. House was lovely, neighborhood was quiet and peaceful. Wish the pool was warmer, but otherwise no complaints. Vanessa was very helpful and quick in having any concerns we had with very few things that had to be addressed. We look forward to returning God willing. Currently my husbands health is of great concern and that is why we"re unable to commit at this time. Vanessa and her team are to be congratulated. Everything is extremely well organized from initial inquiry to checkout. Lovely people as well. House was perfect for us. Would stay again in a heartbeat. Miss that open air living already. Fantastic house! Fantastic service on a short notice booking! We'll meet again next vacation!